Tenley Molzahn runner-up of The Bachelor: 14, may have won the first impression from Jake, but she made a lasting impression on America. Her sweet personality and optimistic attitude were refreshing throughout her season. America’s heart broke when she was sent home in the finale. Everyone wanted Tenley to find love and happiness. I always thought Kiptyn and Tenley would make a great couple. They are both kind and beautiful, which is crucial to every power couple. 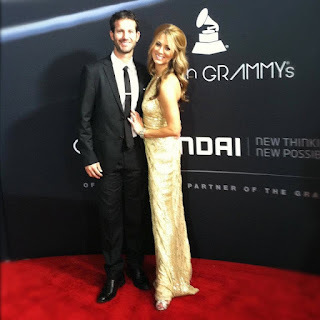 Kiptyn and Tenley on the red carpet. Photo courtesy of Tenley Molzahn. I was thrilled when I found out Tenley and Kiptyn were going to be together on the first season of Bachelor Pad. They had an alliance with Dave Good, Natalie Getz, Elizabeth Kitt and Jesse Kovacs. The three couples had control of the house and made it to the final three. Tenley and Kiptyn competed against Natalie and Dave in the finale. Even though they did not win Bachelor Pad, they walked away with love. Kiptyn and Tenley paddleboarding in Hawaii. They are still together and happy as ever. Not everyone finds love on The Bachelor, but some find love with other members of Bachelornation. I have been a fan of Tenley from the beginning and wanted to see what she was up to. Tenley did an interview with The Bachelor Expert. She explained her thoughts on The Bachelor: 16, Bachelor Pad and what is going on in her life. 1. How has life been since the Bachelor Pad 1 concluded? Life has been busy, exciting, and wonderful! Unfortunately Kiptyn and I didn't win the money on Bachelor Pad 1, and were left with both of our "runner up" titles, BUT we got each other, and it's been so good! I am so grateful for the opportunities that have come my way since wrapping up my time with the Bachelor franchise! I worked as a correspondent for E! News' Daily 10 before it was (sadly) cancelled. That was such a great insight to a career I would never have dreamed of getting to pursue! Not only have some awesome job opportunities come up, but an incredible platform to give light to things that I love and am passionate about! Kiptyn and Tenley in Hawaii. 2. What are your thoughts on this Bachelor season? To be completely honest, I feel like this last season of the Bachelor with Ben was rough. As I was watching I thought, "this doesn't reflect the positive experience that I had when I was on The Bachelor". There was so much competition and negativity highlighted this season, and to me that is unfortunate. I know that they're creating a TV show, and drama draws people in, but so does a good love story or the chance of one! This being said, I do think that the producers saw that they may have let things get a little too off track and are pulling it together for a good, classy season of The Bachelorette with Emily! 3. People have compared you with Lindzi, for receiving the first impression rose, being the runner-up, etc. Who do you identify with the most this season? I'm flattered by the comparisons, Lindzi seems like a sweet girl. I see the simple comparisons plain as day... we both had the first impression rose, we were runners up, and for both of us the fact that we were not the "chosen ones" was probably the best thing for each of us! As much as Ben and Jake are decent guys, they weren't for us! Personality wise I do see some similar characteristics, but I see a few similarities between Kacie B. and myself too! 4. I always hope the runner-up finds love. Which Bachelor guy do you think would be best for Lindzi? Hmm... there are many I haven't met in person yet. Someone "Real" and fun! Which past Bachelor dude lives near her?! For myself I think the reason Kiptyn and I ended up together is because we had become such great friendship and lived near each other so there was time off camera and near one another that was in our favor before our relationship became what it is now! Funny thing is, Kiptyn and I were both opposed to dating someone from the Bachelor franchise, but there was always chemistry there & once we were around each other constantly on Bachelor Pad, it became inevitable! :) So for Lindzi, I hope that she will meet someone near her, develop a friendship, and then have the greatest love ever! And maybe that someone will be from the Bachelor franchise. Kiptyn and Tenley at the Grammys. 5. What women do you hope to become friends with from this season? So many of them! Kacie B. would be a blast and from what it seems, she and I have a lot of the same interests, I see the possibility of a lot of laughter hanging with the two of us! Lindzi seems like an awesome girl that would be so much fun to go to happy hour with and chat about life and love. Emily seems like she'd be one of those great friends that would be a pillar in your life, someone to call for any moment in life. The list could go on, even with the negative stuff on this last season, there seems to be a handful of fun girls! 6. You and Kiptyn were Bachelor Pad 1 runner-ups. What do you think about the Bachelor Pad accepting random people to compete also? When I heard that they were accepting random people to compete, I couldn't imagine it! Having been a part of the original "guinea pig" season I will probably only be able to imagine the way we experienced it. I think it adds a whole different element, but to me I think it's too "MTV"! I feel like there are enough old cast members that the Bachelor franchise audience could be re-introduced to and compete against more recent cast members. I'm sure I'll love it either way! I'm curious to see how it turns out. 7. Are you excited for Bachelorette Emily’s season? 8. How would you describe your style? I always choose solid colors vs. prints, I choose simple accessories. I love wearing loose, off the shoulder tops with my ripped jeans and sandles, but I love putting on a cute sundress with heels! Kiptyn and Tenley at an Agassi event. 9. Where are some of your favorite places to shop? 10. Your make-up always looks flawless. What are some of your favorite brands of make-up? Thank you! That is my goal, flawless and natural! I love Nars, Mac, and TooFaced, but some of my favorites are from the "more affordable" stores like Target or pharmacies. A favorite of mine, my bronzer, it's by NYC. Super affordable & photographs well! Another favorite, Loreal Voluminous mascara! ABSOLUTELY! Wouldn't that be Incredible?! Kiptyn and I would love to do something like Amazing Race! And I would feel so blessed to get to do Dancing with the Stars! Both are favorite shows of ours. 12. What is up next for you? Are there any dreams you would like to accomplish or working on? Currently I'm the Editor-In-Chief of Fashion 5.0 Magazine, a fashion magazine in San Diego, and I am having fun with that! My biggest focus and project has been working on sharing my Gluten-Free & healthy Lifestyle in a few different ways! Projects are underway now and hope to be sharing soon! I'm always up for an adventure and can't wait to see what is to come! I hope you all enjoyed my interview with Tenley. She is a great role model and a wonderful person. I am happy I had the chance to interview one of my favorite contestants. You can keep up with Tenley through social media and her website. I absolutely love Tenley. I love her and Kyton together too. They were definitely my favorite couple on my personal favorite season of Bachelor Pad.